017 | RangArt In Malaysia | Locaux! I love when my art brings smiles on peoples faces, this is what I am working for. If there is only one thing I know for certain, it’s that home is where the heART is! We meander through life looking for a myriad of things, home being one. Some of use find home is a certain location, others take home with us wherever we are. This week’s guest is the latter. Pooja Verma was born to make art. And though life and tradition pointed her toward a conventional ‘safe’ life, her true nature beckoned. She has found her way home. So listen to her story her soul’s work successfully manifesting itself, in a foreign land. Verma is a full time artist living and working mostly from her home studio in Kuala Lumpur, Malaysia. She is largely self taught, who began drawing and painting starting from childhood. She is specialized in using the palette knife and heavily textured mixed media, that lend themselves to creating her signature colorful acrylic paintings. 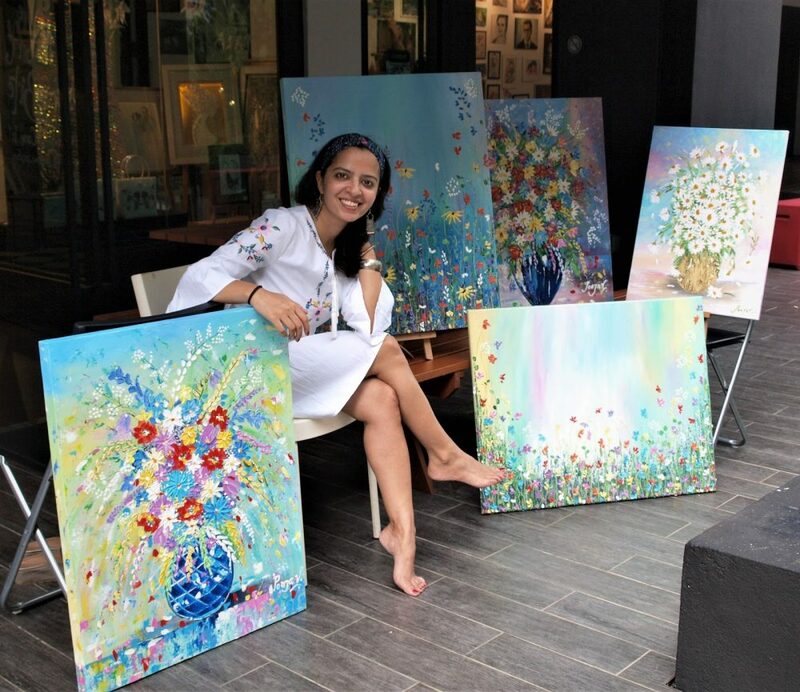 The quintessential artist, she is highly inspired by nature’s landscape, gardens and floral arrangements. Using cheerful colors, particularly blue backgrounds, she seeks to elicit positive feelings and smiles from the viewer. According to her: “There is so much darkness in this world.” She doesn’t a want to paint the dark and gloomy side. She aims to lift spirits with colors and subjects that give joy. Hence the vibrant and uplifting colors into positive, hopeful, joyful, dreamy, and happy paintings in palette knife strokes. With this quintessential artist everything has to be original have a touch of an artist. She is continuously developing her style and not afraid of experimenting. Today her paintings have home across the world, in India, Malaysia, Indonesia, Singapore, Australia, Netherlands, Germany, Ireland, Belgium, France, United States, Canada and London. 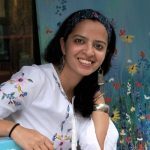 She is the Founder, Creative Director and Facilitator of RangArt – a platform of art workshops for kids and adults. RangArt is celebrating five years anniversary now. If you an expat entrepreneur, or have a business that supports these transitions, Locaux wants to share your story.